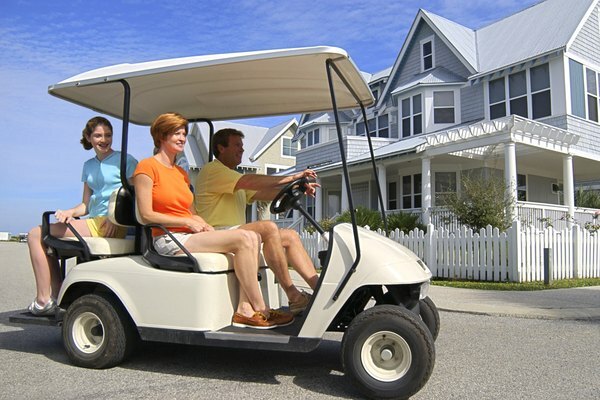 Some retirement communities let residents drive golf carts on public streets. There's no such thing as a typical retirement lifestyle anymore. An old-fashioned view of retirement includes rocking chairs, fishing poles and an RV, but every retiree approaches the golden years differently. If you want an active retirement lifestyle with an assortment of amenities close at hand, a self-contained retirement community can make these years the best years of your life. A self-contained retirement community is a subdivision, village or town that was designed for senior living. These communities often impose age restrictions on residents, so that most of the population is always 55 or older. They feature plenty of single-story and wheelchair-accessible housing for seniors who live on their own, and many offer "assisted living" options that include help with housekeeping, meals and transportation. Developers planned these communities to provide close proximity to health care, recreation and entertainment. Older adults have special health care needs, and a senior living community fulfills those needs by providing ready access to geriatric medical specialists. Geriatric medicine focuses on preventive practices and prescribes treatments that improve a patient's functionality, make quality of life a high priority and incorporate in-home care whenever possible. For example, at the time of publication, there were 117 geriatric doctors located within 25 miles of the self-contained retirement community of Sun City West, Arizona. These doctors help retirees stay mobile and independent. Nearby hospitals and other medical specialists also serve community residents. Contemporary retirement communities provide recreational facilities for active seniors. Residents don't have to travel to keep up with the sports and other activities they enjoyed before they retired. Fitness and dance studios offer group fitness sessions geared to the residents' needs and abilities. A retirement community may also provide amenities such as swimming pools, bowling alleys, billiard rooms and courts for basketball, volleyball, bocce ball, badminton, shuffleboard, tennis, horseshoes or lawn bowling. Many senior living communities are conveniently located near at least one golf course. Sun City West in Arizona boasts seven golf courses, and Laguna Woods Village in California has two golf courses and an equestrian center. Seniors who live in self-contained retirement communities don't have to travel far for entertainment. Many communities have at least one clubhouse or central gathering area for social events among residents, and some have a hall or ballroom for concerts and theatrical performances. These community centers also include arts-and-crafts hobby rooms, where residents get together for woodworking classes, computer workshops and interactive-game tournaments. Some centers also provide garden plots, where green-thumbed residents can grow food or flowers. Senior Care of Colorado: What Is Geriatric Medicine?